Harness the power of bionic technology to make your everyday life easier — and live the way you want to. Are your knees holding you back from the life you want? When you have a knee injury, you don’t need a pedometer or a FitBit to count your steps. The pain counts them for you. From your bed to the shower, down the stairs, out the door to work. And aside from the pain, there’s the embarrassment. Maybe you wait till everyone else has left a meeting before lifting yourself from your chair. Maybe you drop a pen, and have to bend to pick it up. These are challenges you don’t even think about when your knees are healthy. But if you already have a knee injury or condition, we want to help you. The Levitation Knee Brace can help lift a significant portion of your body weight. This customizable assist means there’s less friction between your femur and patella — and less friction means less pain. Levitation absorbs kinetic energy when you bend your knees and releases the energy when you straighten your knees. The Levitation can be used to help you crouch, walk, and climb stairs with less pain. Levitation™ is the world’s only compact and powerful bionic knee brace capable of reducing pain while enhancing strength and mobility. 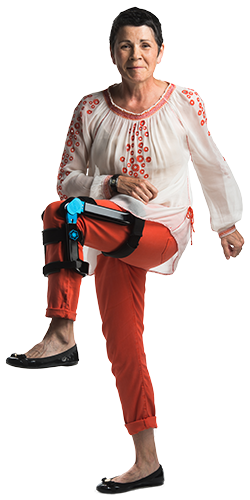 Levitation's™ bionic hinge stores energy as you bend your knee and returns that energy as you straighten your leg. Levitation™ assists your movement to get you back on your feet to the things you love most in life.